Thermal Solutions and Systems that utilize natural or forced convection to cool devices. Includes fans, blowers, and air movers as well as passive and air-cooled heat sinks. 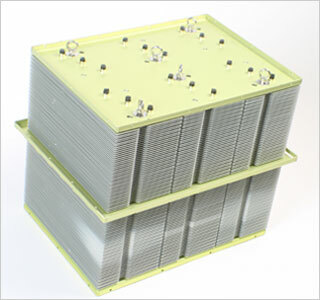 Air cooled thermal management solutions are the most common cooling method. They are cost effective and can be a relatively straightforward to install and maintain to extend a device’s lifetime and performance. As the most well-known and widespread manner of cooling, air cooled systems can be found across all industries and in a large percentage of electronics. Air cooled solutions range from natural convection heat sinks to advanced air flow management systems utilizing custom fans and blowers or even synthetic jet technology. These solutions can be further augmented by incorporating two phase technologies such as heat pipes or vapor chambers for better heat spreading across the passive or forced convection heat sink base. Aavid, Thermal Division of Boyd Corporation has both design and manufacturing expertise across all heat sink technologies from basic aluminum extrusions to complicated zipper fin or die cast geometries. This experience combined with Aavid engineers’ in-depth knowledge of air moving technologies and air flow management ensures that our air-cooled systems are fully optimized and efficiently fabricated for optimized product performance, lifetime, and reliability. Heat Sinks can be used on their own with appropriate interface material and mounting for a completely passive solution cooled through natural convection to the ambient air. However, more advanced systems utilize heat sinks engineered for forced convection cooling with use of a fan, blower, or Aavid SynJet for more powerful cooling of higher heat loads. 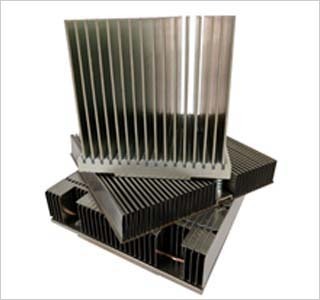 Heat sinks come in a variety of constructions and choosing the correct geometry is dependent on application parameters such as air flow, flow type, environmental conditions, and available volume. 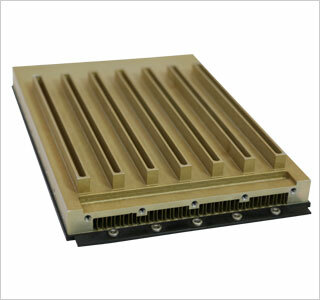 Heat sinks are typically made of copper, aluminum, or a combination of materials based on project requirement. These heat sink assemblies can be fabricated in a variety of ways to best suit application needs. Fans and Blowers greatly improve the performance of air cooled thermal management solutions. By adding increased air flow to forced convection heat sinks, engineers can cool a much higher heat load within a similar footprint. 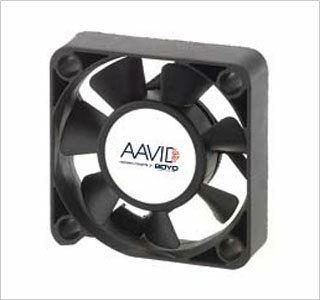 Aavid has hundreds of standard fan options including preassembled fan heat sink combinations. Fans and blowers are easily paired with existing or custom heat sinks to improve the effectiveness of the thermal management solution. We are experienced in customizing high performance fans and blowers for more demanding applications. Our experienced design team, and comprehensive manufacturing and test facilities, can produce higher flow rates while minimizing acoustics and vibration, allowing customers additional system design flexibility. Air to air heat exchangers are an effective way to transfer heat between two separate air systems, whether it’s moving heat from inside an enclosure to ambient air or from one enclosed air system to another. By using conduction or passive two phase systems like heat pipes or vapor chambers to transfer heat from one side of the heat exchanger to the other, Aavid can design and manufacture effective air-to-air heat transfer solutions. Our engineering team has access to a broad range of in-house construction methods for heat exchangers including folded fin fabrication, zipper fin production, nickel plating, heat pipe manufacturing, vacuum brazing, dip brazing, soldering, and welding. While our design team is skilled in designing new Air to Air Heat Exchangers, our engineers can also replicate original equipment for aftermarket heat exchanger core replacements. Replacing the original heat exchanger core utilizing our re-core process can extend the lifetime of your system and greatly reduce maintenance costs. Integrated enclosures or chassis that include thermal management technologies are becoming more popular as application SWaP requirements become more stringent. More creative engineers are incorporating heat spreading, thermal joints, and other techniques so that enclosures and chassis can act as both a structural and thermal solution. The additional surface area improves heat transfer from the chassis to the ambient air, which can be designed for natural convection or benefit from the addition of a fan or blower. Popular fabrication methods include aluminum die casting, sheet metal bending, welding, dip brazing, and vacuum brazing as well as integrating two phase or graphite heat spreading technologies such as heat pipes and k-Core encapsulated graphite.